TORONTO, ON – Bellwoods Brewery has announced that two popular limited edition brands will be returning to the bottle shop at the original Ossington Avenue location today, and will also be among the first beers to be available at the new Hafis Road location when it soft launches this weekend. Farmageddon is a special version of the brewery’s classic Farmhouse Saison that has been aged in various barrels with multiple strains of Brett and other wild yeast, and then blended to produce the final product. This edition of Farmageddon is the 11th to be released, and is a blend of beers that have been aged between 12 and 14 months. Bounty Hunter is a strong porter brewed with coconut and vanilla bean named in honour of a certain candy bar that features similar flavours. 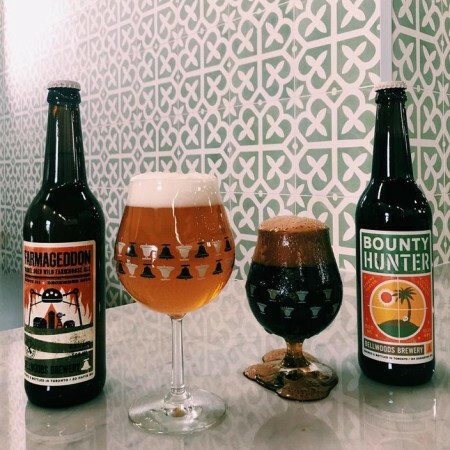 Both beers will be available today (December 16th) at 11:00 AM in the Ossington shop, with Farmageddon selling for $13 and Bounty Hunter for $10 per 500 ml bottle. The bottle shop at the new Bellwoods production brewery and barrel house at 20 Hafis Road will be open tomorrow (December 17th) from 1:00 to 5:00 PM. Details of the opening and other beers that will be available will be announced by Bellwoods later today.